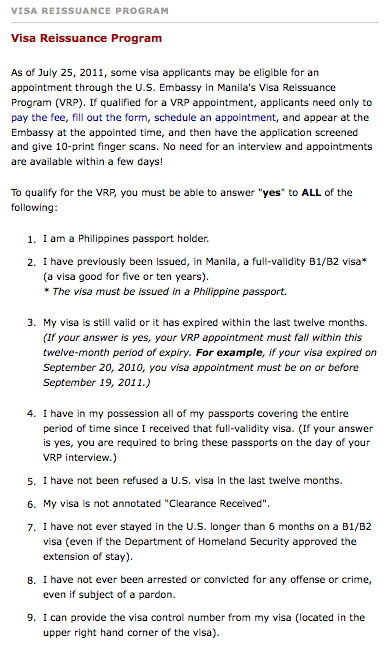 I just renewed my US Visa via their Visa Renewal Program. It was pretty painless, except for the waiting time and the lining up. But since there was no more interview and no documents required - perfect right? I hope you qualify! Because if you do - my gosh, it so freaking easy! You just need to pay the fee, take a 2" x 2" photo, fill out the DS-160, and call to schedule an appointment! What's even better is that - you have priority with the appointment dates! I was scheduled for an interview last Monday (2/27), and yesterday afternoon (3/01) - I got my Passport with a 10-year visa! it really is a great news and hassle free. haven't and attempted and tried securing US Visa, no plans yet of going out of the country even for a vacation only...maybe in the future, hopefully.